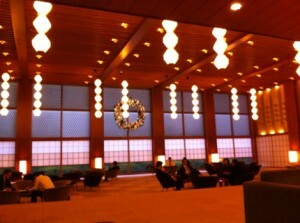 I interviewed smooth jazz legends Fourplay on Monday 2010.12.6 at the very swank Okura Hotel, Tokyo which has one of my favourite interior spaces – the deco inspired 60′s sci-fi style lobby!! I had to get a snap with the season’s decorations.. Listen to the Fourplay interview in the Lounge set of programs. This entry was posted on Monday, December 6th, 2010 at 5:33 pm and is filed under Check-In News. You can follow any responses to this entry through the RSS 2.0 feed. You can leave a response, or trackback from your own site.